This is a blue ensign with the Jordani national flag in canton, and a white emblem (two crossed swords under a crown with a wreath around it) in the fly. This flag is used at different kinds of police stations (border police as well as tourist police and "normal police"). I was to Jordan in March 2000. There was a version of the police flag at the Desert Police station at Wadi Rum and at the Aqaba airport, both without the white badge. But the badge was included on at least one of the flags at the Aqaba-Eilat border crossing post. The police flag I succeeded taking a photo of had a star with a diameter of 1/3 of the [canton's] hoist. At the site of the Jordan Traffic Institute there is a photo of what looks (the picture is small) like a plain undefaced JO blue ensign. A police blue ensign with a much more detailed police badge is shown here. This photograph shows a badge with some Arabic inscription, though. As this is the flag in the office of the Director of the Public Security Department, the flag is bit more elaborate. The flag of the Public Security Directorate is shown here: a blue ensign with the dept. badge in the fly. The website of the Slovene Police reported on 1 March 2007 the visit of Slovene policemen to the Jordan International Training Police Center. A colour photograph by Dean Božnik shows delegates holding the flag of the Jordan International Police Center, which is light blue with the Center emblem in the middle. The emblem shows on a (dark) blue disc a brown pair of scales in front of two silver swords crossed per saltire and surmounted by a brown crown, the whole being surmounted by the national flag of Jordan. The name of the Center is written in white letters around the inner border of the emblem, in Latin script in the upper part and in Arabic script in the lower part. 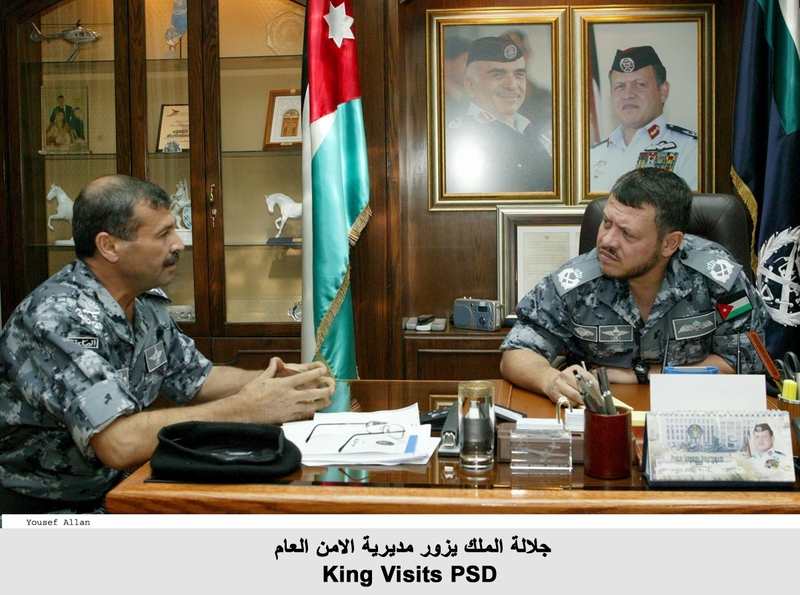 The emblem is quite similar to – but not identical with – the emblem of the Jordan Public Security Directorate. The officers had just returned from a one-year stint at at the JIPTC, where they had been part of an international mission to train Iraqi police. Additional background – and a larger emblem – is available here. The same page also gives a link to the JIPTC website, but it appears to be dead.